Today, after work, as I was sitting on the shores of the Mediterranean ("sitting on the shores of the Mediterranean" - I love my life, seriously), I noticed some palm trees near the apartment block that I live in, and I thought about the first time I ever saw a palm tree in real life (traveling down the coast of California 10 years ago, for the record). And I remembered how ecstatic I was (Jeremy, vouch for me here, okay? ), how I got so excited - "THESE ARE REAL ACTUAL LIVING PALM TREES I'M SEEING, IN PERSON, OMG!!! 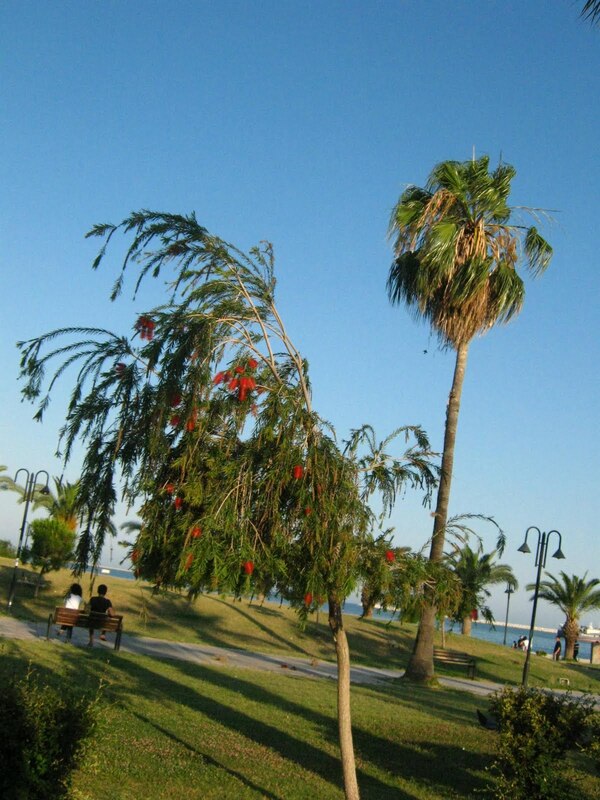 ", and now I barely notice them, having lived the past almost-3 months constantly surrounded by the presence of palms. I thought about how desensitized one can become , when constantly being shown newer, more extreme, more wonderful, exotic places. When I was in Iraq ("When I was in Iraq" - sorry, gotta say it again, I LOVE MY LIFE, seriously), I had a conversation with Joe, the room-mate of my friend Emily whom I was staying with, about this sort of thing. He himself was currently teaching in Iraq, previously living in Yemen, before that traveling through such varied places as Afghanistan, Azjerbaijan, and Algeria (and that's just the first letter of the alphabet). He was saying that after having these sorts of amazing adventures, (over a decade on the road total, traveling and working in the most off-the-beaten-path places one can think of), he couldn't go back to the 'normal' world, that is to say, go back to living in Canada and having weekend BBQ's with the neighbours, discussing the latest sports event or what public blunder Stephen Harper had made most recently. It was next to impossible for him to find any enjoyment in the, for lack of a better word, mundane, and really, after seeing the hills of Iran, the Sahara desert at dawn... or living with the Iban tribe of central Borneo, who can blame him? I sometimes I worry I am becoming this way, that I wont ever again be able to work a 9-5 job in a safe and comfortable (read: boring) place (working this job in Mersin has been difficult enough), which scares me a little. Then again, as I noticed the palm trees today, I had this mental dialogue (that I am now writing here), with myself, and I thought about all I had seen on this trip...and I giggled a bit because I really WAS giddy about it, and i feel like, as long as im giddy im not jaded, so that must be a good thing. right? Anyways, if i have to work a real job and live somewhere more permanently, if i can do it in a city like Istanbul for awhile, maybe that will be a smoother transition from "traveling gypsy freak who has the tan lines of an illiterate olive picker" to "normal respectable pasty Canadian working citizen". Because if i came back to Canada right now, especially just in time for Fall (read: Winter), id be ripe to suffer from some intense reverse- culture shock i think. However, I also thought today how much I miss my family and CAT, oh god Truman i miss you and your whiskers waking me up so much, so i know eventually that missing will pull me back to Canada. But for now, I am really happy and still riding the giddy-wave that 3 months spent in the most mystical places on earth will cause. It's like ive been possessed by the Djinn of adventure and he wont let go.